German philologist; born at Hamburg Sept. 4, 1792; died at Minden Dec. 28, 1847. Educated at the gymnasium of Altona and later at Hamburg, he embraced Christianity in 1809. He then studied theology and philology at the universities of Helmstädt, Göttingen, and Leipsic, graduating in 1813. After being a private teacher for a year he in 1814 became state teacher at Hirschberg in Silesia, and in 1821 was appointed principal of the gymnasium at Minden, which position he held until his death. His work in this school was of great importance. 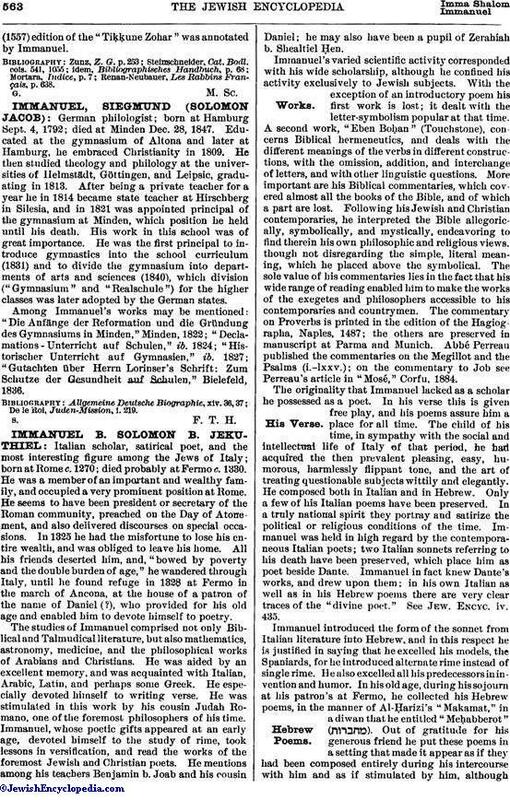 He was the first principal to introduce gymnastics into the school curriculum (1831) and to divide the gymnasium into departments of arts and sciences (1840), which division ("Gymnasium" and "Realschule") for the higher classes was later adopted by the German states. Among Immanuel's works may be mentioned: "Die Anfänge der Reformation und die Gründung des Gymnasiums in Minden," Minden, 1822; "Declamations-Unterricht auf Schulen," ib. 1824; "Historischer Unterricht auf Gymnasien," ib., 1827; "Gutachten über Herrn Lorinser's Schrift: Zum Schutze der Gesundheit auf Schulen," Bielefeld, 1836. De le Roi, Juden-Mission, i. 219.